Functional medicine addresses the fundamental root causes of disease, using a systems-oriented method and involving both patient and practitioner in a therapeutic alliance. It is a development in the practice of healthcare that better addresses the healthcare needs of the 21st century. By shifting the traditional disease-centered focus of medical practice to a much more patient-centered strategy, functional medicine addresses the whole person, not just a disconnected collection of symptoms. Functional medicine professionals spend time with their patients, listening to their histories and looking at the connections among genetic, environmental, and lifestyle elements that can influence long-term wellness and complex, chronic disease. In this way, functional medicine supports the unique expression of health and vitality for each individual. Click HERE for a downloadable document about functional medicine. 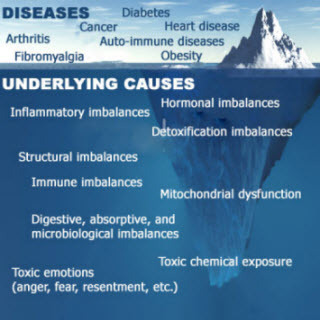 This graphic illustrates the functional medicine approach, and that underlying causes matter most. “When the head of the world-renowned Cleveland Clinic approached Dr. Mark Hyman about creating a department that would employ the doctor’s specialty of “functional medicine,” Hyman was typically blunt. “If I create a program there, it would cut the number of angioplasties and bypasses in half, and reduce hospital admissions,” he told clinic CEO Toby Cosgrove.” Read more HERE. Dr. Bailey trained in 2009 with Dr. Hyman at the Institute for Functional Medicine’s extended training “Applying Functional Medicine in Clinical Practice”. Dr. Bailey uses the principles of functional medicine, as well as training in chiropractic orthopedics, in his approach to chronic illness. Nothing on this site is intended to be used as a substitute for advice of a physician. Do not modify your diet, exercises, or medications without first seeking the advice of a physician. Information on this site is for educational purposes only. No claims have been approved by the FDA unless otherwise indicated.